Having a jump rope for CrossFit can be immensely beneficial to the overall quality and efficiency of your workout. However, it can be hard to find a jump rope that can keep up! It has to be the right weight, ergonomically comfortable, and durable. It has to work as hard as your CrossFit shoes! Out of the many jump ropes out there, it’s hard to decipher which could be the best one. Well, it turns out that the best of the best has been neatly compiled for your reviewing pleasure. Today, I’m going to share with you the best jump ropes for CrossFit so that you can beat your record, impress your friends, and, most importantly, get in the best shape possible. Let’s get started. The benefits of jump rope training are tenfold. Jumping rope requires muscular coordination and agility, which can make you lighter on your feet in other active areas of your life. It strengthens both the upper and lower body simultaneously, while also burning many calories in a short period of time. Jumping rope for ten minutes is equivalent to running an eight-minute mile. Talk about efficient! The increased coordination transfers over to brain awareness, developing both the left and right hemispheres of the brain. It improves spatial awareness and reading skills. Besides the cognitive benefits, the physical benefits are plenty, as well. Jumping rope improves bone density and breathing efficiency. It even decreases the likelihood of foot and ankle injuries because jumping rope requires you to remain light on the balls of your feet. Most athletes know how important it is to stay on the balls of your feet and have strong ankles and joints. Moreover, a jump rope is lightweight and convenient to bring around anywhere. It’s possibly one of the most efficient exercise tools available. What you look for in a CrossFit jump rope will vary depending on your level. Beginners may want a more weighted jump rope so that they can feel the swing of the rope around them. Intermediate to more advanced trainers usually likes a jump rope that’s lightweight so that they can perform more intense or faster jump combinations like double-unders. Handles. Most users prefer lightweight handles that are ergonomically shaped. Functionality. The rope should turn in a smooth and quick motion. Versatility. Are you able to adjust the length of the rope? Can you use it in different environments? Cable material and quality. Cables can be made with wire, vinyl plastic, rubber, actual rope, cloth, or even leather. Each of these has a different feel and weight to them, something to consider when choosing your own. As a general rule, jump ropes with vinyl plastic or rubber work great for anyone from beginning to advanced levels. More advanced jumpers may want to try something more lightweight like rope, cloth, or leather. The WOD Nation Speed jump rope makes the top of our list. This is the best speed jump rope for advanced CrossFit trainers that is lightweight, speedy, and durable. It’s made ergonomically sound and structured to give the most efficient jump rope experience. The rope is a nylon covered steel cable, which moves through the air quickly but with enough weight to give some momentum. Many users find they can complete doubles and even triples easily with this rope. The rope comes in at 11 feet long and can be cut to fit your perfect height. You even get an extra rope included with your order in case something happens to the original. Ballistic nylon resin handles are made with liquid steel bearings for an ergonomically comfortable hand hold. Extra screws are included as well. This is a high-quality jump rope that many people find helps them increase their workout efficiency. It is the best jump rope for double-unders and other jump rope performance. This Survival and Cross jump rope comes in second on our list, and for a good reason. It’s a lightweight, adjustable jump rope made with a convenient and durable design. It’s great for performing tricks like speed skipping, doubles, and triples. The right-angle cable rope is fast, durable, and flexible, able to keep up with your quickest moves. The cable does not kink and bind at the handles but remains tangle free. This is a great speed jump rope for CrossFit. The rope is easily adjusted using two sliding screws and collars. Slide the screws and collars into the handles at the desired length on the cable for your perfect length rope. 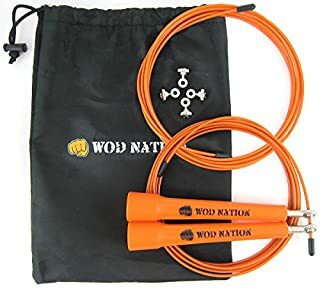 Many users will find this one of the most durable jump ropes for CrossFit available. It comes with a downloadable exercise manual as well as extra adjustment screws. 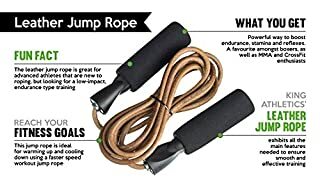 The Survival and Cross jump rope is a versatile rope that could help you achieve your loftiest fitness goals. For a more ergonomically comfortable feel, you may want to go for the STRONG Fitness Jump rope. This is the longest jump rope for CrossFit of the list, coming in at 11 feet, and is made with comfortable foam grip handles. 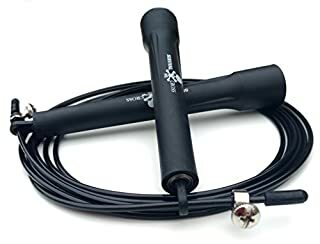 The handles on this jump rope are 6 inches in length, the longest of any of the jump ropes reviews. If you like to use your whole hand to swing the rope, this may be the jump rope for you. The foam grips make it comfortable to hold for long periods of time, and do not slip even when your hands start to sweat. The PVC coated cable can be trimmed to match the height you need. The cable is easily adjustable using the oversized thumb screws. It’s resistant to wear and tear and can be used indoors or outdoors. 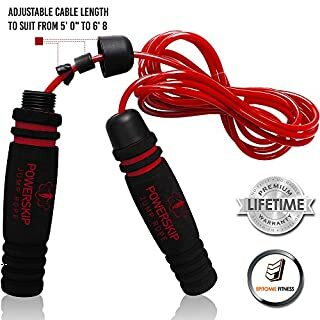 This jump rope comes in at the lowest price of all of the ropes in this list. It also is backed by excellent customer service. There’s not too much wrong you can say about this best speed rope. Epitomie Fitness counters the ergonomics of the STRONG jump rope mentioned above. The Epitomie Fitness PowerSkip jump rope is made with memory foam handles for an even more comfortable grip. This is matched with an efficient speed cable to make for the best jump rope for CrossFit. Let’s talk about the handles. They are lightweight and ergonomically shaped with memory foam, as mentioned before. This makes the handles extra comfortable to hold. They also don’t absorb sweat. The weighted speed cable is coated with a polymer and makes for great responsiveness when swinging. This paired with the ball bearing system in the handles makes for a great feeling jump rope workout. The high quality of this jump rope is reflected in the price point. This is a jump rope that will last you a long time, is tangle free, and comes with a lifetime warranty. It also comes with training videos online for free. The King Athletic jump rope comes in last on our list, but should not be glazed over. 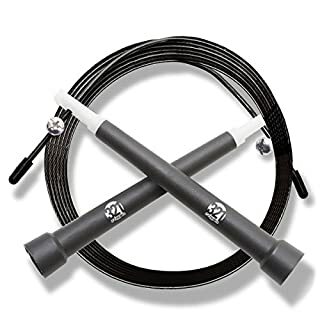 Similar to the Epitomie jump rope, the King Athletic jump rope has custom molded foam handles with super-speed ball bearings. This means the jump rope is weighted, great for beginners to intermediate-level users. This rope is made from genuine leather, also contributing to the weight of the jump rope. The extended 9.1 length is adjustable by cutting. The leather is great material that will last a long time. This is a rope that can withstand heavy-duty usage. King also includes their 200% guarantee, meaning if something is wrong with the original jump rope they sent, they’ll give you a refund and send you a new one. Not too much to lose there. This jump rope does come at a higher price point, but this is because of the high quality. It comes included with 2 e-books with training ideas as well. Some people may notice that the jump rope can tend to tangle at times. Jumping rope can help improve your cardiovascular health, endurance, coordination, and overall well-being. Become a pro at jumping rope at your Crossfit gym, and impress your friends with your doubles and triples. To do so, you’ll need the best CrossFit jump rope, and I’m sure you’ll be able to find one from the list I reviewed above. Which Crossfit jump rope is your favorite? Share with us your best jump ropes and how you they match up with your gloves for CrossFit.